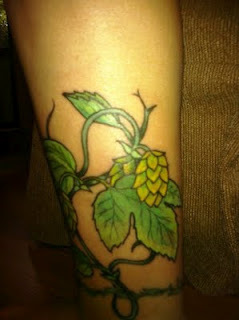 Beer purists, turn away now, today's post isn't about our favorite hop juice. Instead I have for you a peek at SakeOne, a sake brewery (kura) in Forest Grove. Clued in to its existence by Brewvana (Van of Gigantic led a connoisseur tour that included a stop there last Sunday) and looking for another "different" thing to do with our visitors from out of town we braved the drive into the depths of the western suburbs. Brewing sake isn't greatly different from brewing beer however instead of using grain, sake of course uses rice as the sugar/food source. Just as you have to do something to the grain before using it (malting), the rice must be altered. First it's milled, polishing away 40% of the original grain, then steamed (in 800 lb batches) and finally sprayed with Koji mold spores. Then it's ready to be microbial food and eventually sake. Beyond the educational aspect of the tour there was the sampling of sakes. I've had some exposure to sake yet the tasting still provided a great way to learn more about what I like and dislike as well as to try unfiltered, unpasteurized sake only available on tap at SakeOne. As interesting as the tour was and as delicious as the sake was, don't you worry, I'm not giving beer the cold shoulder. This was but a brief departure from our regularly scheduled programming. However if you have the opportunity to visit SakeOne yourself, I'd highly recommend it. The tasting room is open daily and there are tours each afternoon for those who want to see how what they're sampling is made. Who knows, maybe you, like our beer-loving friends will sign up to start receiving bottles of sake at your doorstep. A recent visit by Minnesota friends prompted a quick trip out to Hood River that included a stop the then-three-week-old Pfriem Family Brewers. Here's a look at their set up. Pfriem is located in the end unit of a multi-business building north of 84 and just across the street from the water. Six beers were available at the time of our visit. So of course we had to try all of them. The bar, on the right, and the tables, on the left, share the open layout with the brewery. Hanging metal light sculptures and wood plank decorating give the space character. There wasn't a bad beer in the bunch. However you shouldn't be surprised to find out that the IPA was my favorite. The next time you're out in Hood River make sure to add Pfriem to your list of stops. Their Belgian-influenced beers are a great addition to the more established breweries nearby. The grand opening of the second location of Kells, on NW 21st, and release of three house-brewed beers is today. Seeing as how I was out and about in the morning I figured I could swing by mid-day before they got busy and the traffic/parking in NW became unbearable. Although the day was slow to warm up I couldn't pass up their patio (although come the rain of winter the beautiful wood interior should make for a cozy setting). Sitting down at a small table I was surprised by a few things. 1) The waitress didn't have a beer menu because apparently their taps turn over too quickly. 2) I had to be the one to ask about their house beers. 3) I had to specifically ask for a tasting tray (which although she was agreeable to bringing isn't something they apparently do on a regular basis). 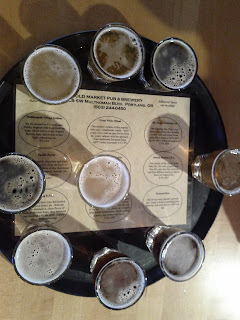 4) When the tasters came out there was not accompanying description of the beers or information regarding ABV, etc. Clearly they're not yet used to or prepared to be visited by beer geeks. In lieu of having information straight from them I had to go scouting about, checking John Foyston's bit in the Oregonian, attempting a fruitless search on their website and finding meager information on their Facebook page. So take the names I assign them with a grain of salt and if you want more actual details...well...good luck. Lager - Going by appearances alone this is a beautiful golden blond that while not cloudy is slightly opaque. 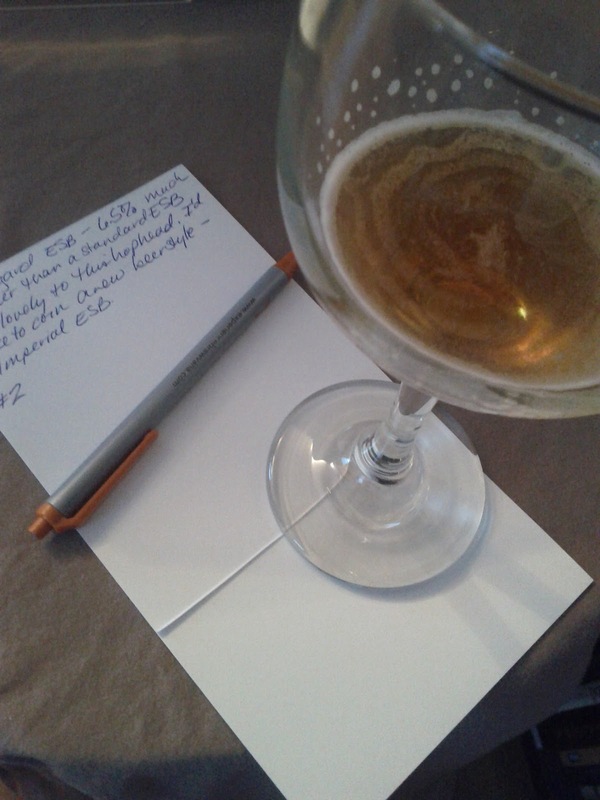 The honey aroma is pleasant but for one who doesn't like a lager aftertaste, drinking it was less pleasant than looking at it or smelling it. Red - Easily discernible from the Hoppy Red even though they are the same color it gave off the sweet aroma of typical red ale. The flavor was on the bland end for a red but to its credit, the lack of sweetness and maltiness made it an easy drinker. Hoppy Red - Lacking much hop aroma, the initial flavor was pretty good - hoppier than a standard red. Unfortunately time/warmth is not its friend as it loses much of its appeal as the temperature rises. While the beers themselves won't do much for a beer geek they'll probably pass muster with the average drinker and with a location in the heavily trafficked NW area they probably won't be hurting for patrons. That's good because although there was nothing off or bad about the beers, there certainly isn't enough to convince me to make a return trip. It's been three years to the month since my hop vine took hold, thanks to Steady Tattoo in Minneapolis, MN. 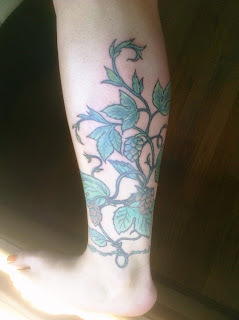 Now due to the great work of Ms. Mikki at Fortune Tattoo here in Portland the vines that were itching to grow have done just that. She did such an amazing job incorporating the new work with the existing work that I had to pull up my original post and compare the pictures side by side. Last December a buddy invited us over for a tasting of beers he had brought back from Canada. It's a favorite destination of his so on another trip this spring he was kind enough to again return with bottles to share. It was a nine-bottle, IPA heavy lineup with the deviators being an ESB from Driftwood Brewing and a porter from Phillips Brewing, both from Victoria. Of the IPAs Total Eclipse of the Hop from Howe Sound Brewing in Squamish tickled my fancy the most. Beyond that it was the deviators which ended up being two of the evening's best beers. Interestingly both came from breweries which had garnered my praise from the last tasting. The Hildegard ESB was much hoppier than most ESBs and if I had to give it a more appropriate name I think I'd call it an Imperial ESB, in part as well because of the 6.5% ABV. At the beginning of the evening there had been a discussion as to whether to start off the evening with Longboat Chocolate Porter, as to have it before potentially destroying our palates with hops, or to wait until the end and have it as "dessert." We ended up holding off to have last and dessert it was! The aroma was strongly roasty but the flavor was that of dark chocolate minus any trace of sweetness. Thanks once again to my kind friend for sharing his haul. I hope you're lucky enough to have at least one friend like that. The Old Market Pub & Brewery has been around since 1994 and although they show up from time to time at festivals (notably Berried Alive in 2011 and Cherried Alive in 2012 at OBF) for the most part it seems that they quietly go about their business. 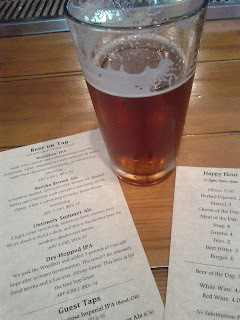 No doubt contributing to that is the fact that they're located in far southwest Portland and even though their second location, The Broadway Grill & Brewery, is more central (1700 NE Broadway) I've yet to hear about an event or beer release there. So in such a beer soaked town as Portland if you're not tooting your own horn it's easy to get overlooked, which is just what we'd done up until recently. 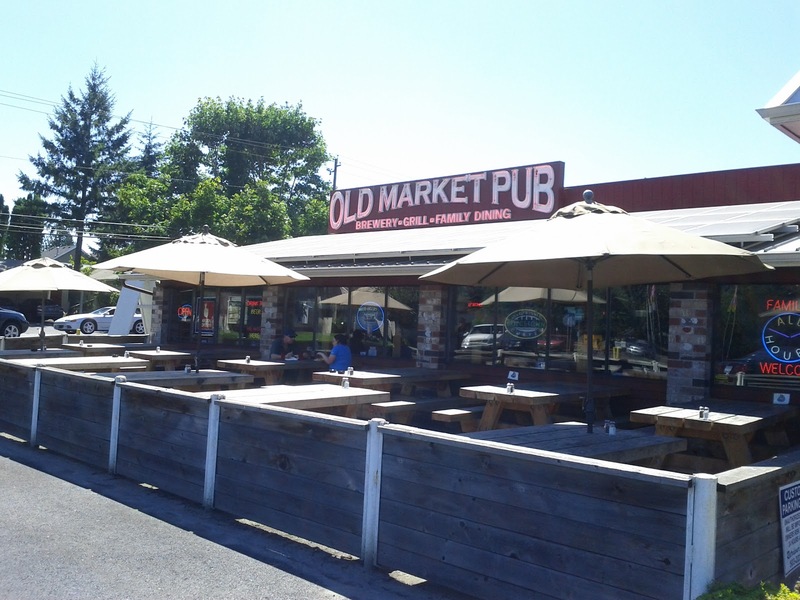 The drive from my inner southeast residence to Old Market isn't long and since Multnomah Blvd nearly sideswipes the pub and brewery it's easy to find. With a large parking lot, large patio and a cavernous interior it feels more suburban chain restaurant than Portland-esque brewery. A quick look at the tap list shows that even though you can get a BMC or a Killowatt Energy Drink on tap, they ARE in the business of beer with 13 house brews pouring. Following the usual routine when visiting a new location we ordered a sampler tray, consisting of nine beers, plus four additional to ensure that we were able to try the entire lineup. The beer offerings included all of the standards - a golden, IPA, stout - as well as a couple of potentially gimmicky ones - Hot Tamale and Ol' Granny Smith. You'll have to go there if you want to know about all 13 but here are a few I found to be worth noting. Rauch Bier - This smoked lager, not generally a style I'm thrilled with, turned out to be very smooth, so smooth that I would have guessed it was served on nitro. It isn't and although there is that liquid smoke character to it, it's pleasant for what it is. Mr. Toad's Wild Red - While I wouldn't consider it a red, there are considerable coffee and roasty flavors not typical in a red, I enjoyed it. Hop On - As with Mr. Toad's, this isn't what one would expect from an amber. Instead it is a hoppy - dry-hopped in fact - bugger that is far from balanced and I loved it. This is an amber for hop heads only and was my favorite of the day. British Bombay IPA - Billed as a NW style IPA, it was more balanced and less hoppy than Hop On yet still tasty. This one would likely appeal to most IPA fans. Hot Tamale - Our waitress gave fair warning that really this would be HOT and I was prepared to be walloped. With no aroma and virtually no flavor the only thing you'll find in a glass of this is capsaicin and pain. Not one to waste beer, I ended up having a bloody mary made with this sample, less the two small sips that had been consumed. Overall their line up is a solid one without any real stinkers. The Old Market won't be making it on my list of regular places to visit but if I find myself in that area of town I'd happily stop in. And when I see an offering from them at a beer festival, you can bet I'll give it a try. Have you been to The Old Market or their Broadway location? What did you think of any beers you've had from them? Sasquatch Brewing has been up and running for a while now, getting their own beer flowing through their tap lines a few months ago. My first visit there was just a few weeks before that happened and ever since I heard they were serving their own I've been meaning to make a trip back. My delay in doing so wasn't necessarily a bad thing since the wait resulted in four of their beers now being available. Woodboy IPA - My hop head palate rejoiced while drinking this beer that uses Cascade and Centennial hops. However if you're not a hop head, in particular not a C-hop head I wouldn't recommend this beer. The description states that it's a "well-balanced ale." I don't know who wrote that but I'm confident in saying that either they're into serious palate-wrecking beers or they were drinking something else. Bertha Brown Ale - Brown ales are not a style I generally like and this one continued that trend. For me it's too sweet (think Newcastle) even though its description indicates that the beer has "a subtle hop presence [that] keeps things interesting" I had a hard time finding much of a hop profile among the malt presence. Dry-Hopped Woodboy IPA - After enjoying the regular version of this beer I was excited about the dry-hopped version. Unfortunately, it didn't even taste like the same base beer was used and came across as very bitter instead of offering "a luscious, citrusy flavor." 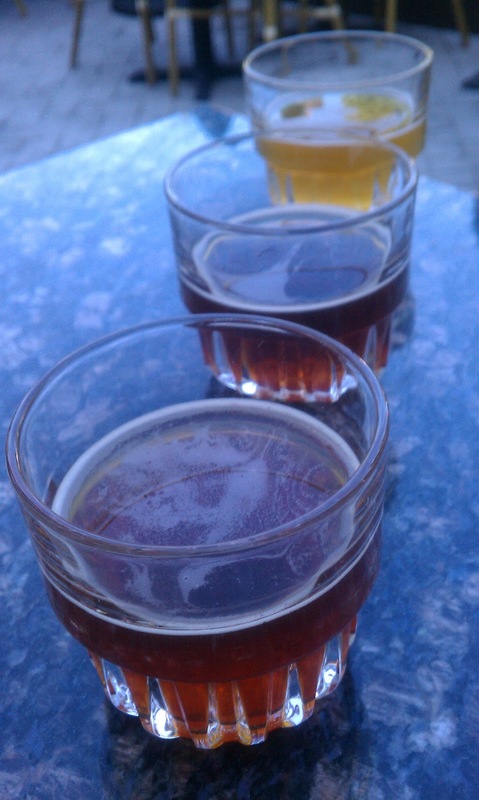 Untimely Summer Ale - Like brown ales, summer ales are not typically my thing. Here was an instance in which I was proven wrong and was glad that by the time I was ready to order another pint it was the only one I had yet to taste. It turned out to be an easy drinking, agreeable brew and the only one on the menu where the description accurately reflected the beer in my glass. 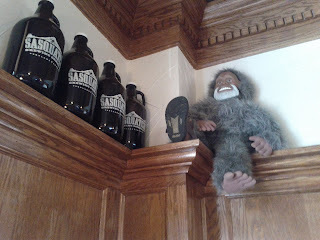 From a beer standpoint, Sasquatch does a decent job. Two of the four beers were tasty and although the third I wouldn't order I suspect those that enjoy brown ales would be happy with it. Unfortunately there are other factors beyond just the beer to consider and while I generally take the stance that if you can't say anything nice, don't say anything at all, I think it's fair to point out areas that can be improved. Food - The menu overall is upscale brewpub but since it was early in the evening we opted for appetizers instead of a full meal. The Cheese of the Day turned out to be a blue variety, served with crostini and a small dish of honey. While the cheese was served at the appropriate temperature and was delicious, at $4, the serving size seemed quite small. 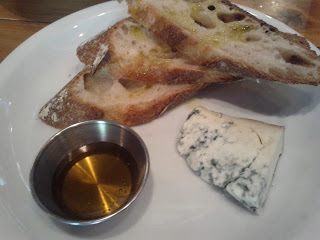 The other appetizer we ordered was their pretzel, drizzled with honey and served with house mustard. Their version is a very heavy pretzel, almost bread-like, without a crispy exterior and overall disappointing. Service - The service at the bar both this time and on our previous visit was both unfriendly and inattentive. I'm willing to give some slack if it's clear that a bartender/server is overwhelmed but when the bar is half full and the restaurant even less full I take offense at being treated as though it's an imposition that I've stopped in with the intent to spend money. Both of these issues are ones that could be resolved and for the long-term viability of Sasquatch they need to be. Portland has too many places where I can get good beer, good food and be treated like a welcome customer for me to bother returning to a place that is only fulfilling one of those three things. 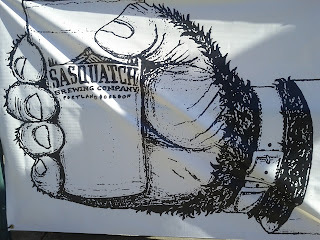 To avoid ending on a negative note, I do feel there is potential at Sasquatch and I'm interested to see what other beers they'll turn out in the future. Besides, "Harry" is keeping watch over the place!